Recent advances in equine medicine and surgery have led to longer performance and life expectancies in our equine patients. Changes in lifestyle and perspective have also led to an increase in horses being kept as “pasture ornaments” after their retirement from work. Whether still in work or out to pasture, aged horses (those 15 years or older) may experience a variety of disease processes that go unnoticed by owners. Dr. Catherine M. McGowan recently presented research identifying “under-recognition of clinical signs of disease by owners compared to when the horses are examined by veterinarians.” Bayhill Equine is now offering a “Mature Adult Exam” to establish baseline health parameters and identify any underlying conditions that may affect the health of our older patients. This article will discuss several of the critical diseases affecting aged horses (those most closely associated with higher risk of mortality) and what your veterinarian can do to identify these disease processes. General observations and recording of vital parameters will help us to identify issues such as a developing heart murmur, respiratory disease (such as heaves or recurrent airway obstruction), skin disease, or signs of endocrine disorders such as Cushing’s Syndrome. Cushing’s Syndrome involves a number of clinical signs such as a long hair coat, excessive fat deposition, exercise intolerance, and excessive urination. 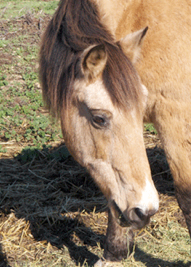 Cushinoid horses also carry a risk of developing laminitis issues. A simple blood test may be suggested to identify if your horse needs treatment for this condition. For further information on Cushing’s Syndrome click here. 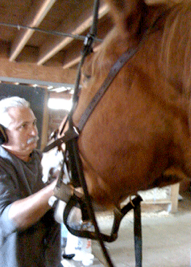 As horses age dental abnormalities become more prevalent. Sharper points, periodontal disease, loose or missing teeth, and abnormal wear are several conditions that are most easily recognized and treated with regular dental exams and floats. Clinical signs that may suggest your horse has a dental abnormality include: dropping food, diarrhea, weight loss, anorexia, and colic. While a major concern at any age, colic of the older horse carries a greater risk of requiring surgical correction and also a poorer prognosis for survival from surgery. There are a multitude of causes of colic (poor diet, dental issues, parasitism, maldigestion, etc.) and your veterinarian can discuss individual concerns during an annual exam. Just as in people, changes to horse’s eyes occur as they age. These changes may occur slowly over time causing site deficits to go unnoticed by the owner. Degenerative changes in horses’ joints occur over time and can present themselves as stiffness, unwillingness to work, or lameness. After an evaluation of your horse’s soundness, we can help provide you with a number of options for increasing the comfort and performance ability of your horse. Blood will be collected to assess the immune system, internal organ function, and serve as baseline values for comparison if your horse becomes sick. Our goal is to provide clients with the most information possible to keep their horses healthy. By recognizing issues early, we can help prevent disease or, if needed, institute treatment sooner. Please call to schedule a Mature Adult Exam for your horse today. Contact the office with questions regarding this article. Adapted from “Update on Aged Horse Health, Management & Welfare” Presented by Catherine M. McGowan at the ACVIM Forum in Montreal, Quebec Canada June 3-6, 2009.